Three pattern winners: Suburbsmama, Attilio and Avery's Mama. I have emailed you each the details. The maker of Darncat patterns from New Zealand sent me a copy of her Jessie Junior Top pdf to try. This kind of top can be worn nearly year round in our cold climate. I made a summer weight one of t-shirt jersey. There's a short sleeve/hoodless option too. I love the contrast strip on top of the hood. The pattern is sized in metric like the popular Hanna Andersson clothes in the U.S. Luckily the pattern is a generous fit because I sewed up a size 2 (years) for my child who normally wears a four. Oops. My waistband cuff is longer than the one suggested in the patten to compensate for the extra length I needed. I totally love it - it reminds me of women's yoga wear. Darncat also has these adorable underpants patterns. Wouldn't these be great to make with some upcycled tshirts? You can visit her shop here for more patterns as well as sizing information. 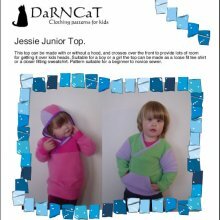 Darncat is generously offering 3 Jessie Top pdf patterns to 3 winners. This is for the wee ones - the pattern comes in sizes 48 - 92 cm - approximately 3 months to 2.5 years old. (Darncat has bigger size ranges in the works). Simply leave a comment below to be entered. Giveaway closes June 26, 2011. I would love to try the pattern! How cute! I'd love to sew some of these up for my littles for this fall/winter! Thanks for the opportunity! Very cute! I like the long waistband cuff too. I have the underwear pattern and it is great! I'd love to try the hoodie as well. the jessie junior would look great on my little girl! That's a great shirt pattern!!! Yay! I think it is so cute! Love the pattern! please add me in the draw! Very cute! I'd love to try this one out for my daughter. Thanks for the chance to win! Like the small floral with contrasting yellow, good one! Thanks for the draw! Love that top! I hope when she goes bigger she goes up to women's sizes!!! Those undies are so cool! I'd love to win a patterns. WOW!! This would be amazing in the jersey that I scored for $2 a metre last month. I am crushing on your cute version! What wonderful patterns! Thanks for the giveaway! Very cute patterns! Would love to win! I'd love to win. And your wee one looks so darn cute in that! Love the color choice you made! long cuffs = cool original = little v! please put my name in the draw, would love to make one for my illy! I have nieces that would look so adorable! Thank you for the chance to win! Very cute, I am a fan of the yoga band! I looove her undies pattens so this should be awesome. Fingers are crossed. i love that top. i've got two girls and think using the same two fabrics but switching which one was the contrast would be super cute! I would love to win these patterns as I'm learning to sew! What a clever way to fix an issue. Looks fantastic.